This 2015 calendar shows the months, weeks, and days of each week for the year 2015 AD, according to the widely used Gregorian calendar. The acronym "AD" stands for anno domini, a Latin phrase which means year of our Lord and refers to the traditionally reckoned year of Jesus Christ's birth. 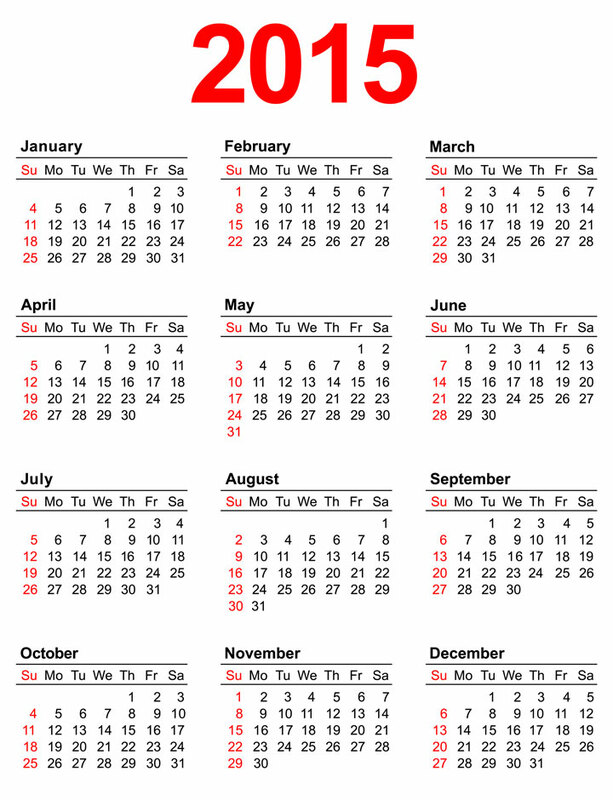 In calendar year 2015, New Year's Day falls on a Thursday, and the month of February has 28 days. In 2015 AD, Independence Day falls on a Saturday, and Christmas Day falls on a Friday. Two printable 2015 calendars are available on this website. The printable calendar version can be printed in portrait mode on letter size paper. If you prefer a more colorful yearly calendar, this professionally-designed 2015 calendar illustration may suit your needs. In 2015, the first day of Spring is March 20, and the first day of Summer — the longest day of the year in the Northern Hemisphere — is June 21. The first day of Autumn is September 23, and the first day of Winter — the shortest day of the year in the Northern Hemisphere — is December 22. 2015 Federal Holidays lists the ten public holidays in 2015 that are established by federal law in the United States of America. The following table includes these ten public holidays and lists several other widely observed holidays as well. Federal holidays are indicated in boldface type. Major Jewish holidays which occur during the 2015 calendar year include Passover (April 9), Rosh Hashanah (September 14), Yom Kippur (September 23), and Hanukkah (December 7). Each Jewish holiday actually begins at sundown on the preceding evening. The year 2015 A.D. spans the end of year 5775 and the beginning of year 5776 on the Jewish calendar.